Last night, as we ate a late dinner following drum practice, I ran something by my eleven year old. He and I both share an enjoyment of first person shooter games, and so I ran a bit of challenging FPS news by him. That news came out of Norway, where the trial of mass-shooter Anders Breivik is underway. Breivik, in the event you don't recall, is the man who walked into a youth camp with automatic weapons and proceeded to methodically kill seventy-seven unarmed individuals. He's utterly unrepentant, viewing his actions as a necessary act of resistance against the forces of Marxist/Islamism, which he sees as all part and parcel of the liberal agenda. In trial this week, Breivik claimed that he'd used FPS games to train for his attack, particularly Modern Warfare 2. Video games facilitate violence, went the headlines. So I asked my son what he thought of this. He was skeptical on two fronts. 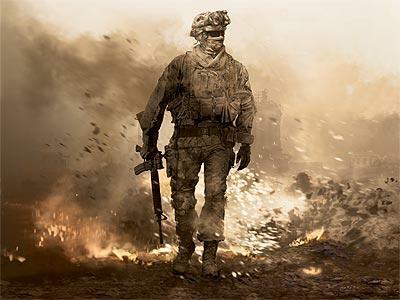 First, he noted that Modern Warfare 2 bears only a passing resemblance to actual combat. It's frenetic, hyperkinetic, and not particularly representative of the dynamics of battle. My eleven year old has a love of history, and knows that warfare itself looks and feels very little like the gaming experience. Second, how much "training" do you really need to kill unarmed kids? My son noted that the mass killing of helpless, terrified, fleeing civilians is not generally part of FPS games. There, the game is about competition with equals, and testing your skills and reaction times against those of others who are equally empowered. And it is simply a game. It is not violent, because those playing it know and mutually assent to the rules of the game. No physical or actual harm is inflicted to opponents. The issue is not gaming software. Nor, quite frankly, is the issue that Breivik is insane. As the court has found, he is not. We might like to think that the problem lies in some deep seated neurological problem, but the pathology of his monstrous acts has nothing whatsoever to do with that. I've spent much time with schizophrenics in my life, and gotten to know those living with real clinical mental illness. Some have been my friends. From that context, it is clear to me that there is nothing wrong with the hardware of his mind. I spent some time reading through portions of Brevik's 1,500 page manifesto yesterday. Lord have mercy, what is it with these people and their manifestos? It is "rambling," as they tend to be. But it is not the work of a broken mind. It is not the most original work. In fact, it reads remarkably like the writings of other ultraconservative mass murderers, like also-not-insane Oklahoma City Bomber Timothy McVeigh. It also reminded me a bit of Ayn Rand. It is utterly self-absorbed and convinced that it contains the One Great Truth Only The True Believers Know, wrapping a fundamental selfishness and disdain for other human beings in concepts like liberty and freedom. It is the work of a mind in isolation, tuned only to those who echo its hatred. The issue is the software. Not the gaming software. The wetware software. What it is not is insane. It is not mental illness that drove Breivik to kill, but a pattern of thinking that lead him down that path. That pattern of thinking is not insanity. It is better described as evil. And it's OK to say that word. Much has been made of Breivik being "Christian." But his Christianity bears no resemblance to the teachings of Jesus. Searching his manifesto for the keyword "Jesus" gets you some angry invective about how liberals have stolen Jesus, or are misusing Jesus to excuse being kind to and tolerant of Muslims. The name of Jesus is dropped when he talks about being a Crusader or a warrior. Where Jesus himself is mentioned at all, it is not in his core teachings of love, self-giving, or the Kingdom. Instead, we get two painfully familiar proof-texts about how Jesus gives us the right to armed self-defense. I say painfully familiar because a skim of Breivik's fulminations reads remarkably like the fury in the American ultraconservative blogosphere. The same enemies are cited. The same arguments are made. The same anger is expressed. Ultimately, it's an anger rooted in a transition-resistant culture, and its fear of loss. Clearly, he was an isolated soul, who became so lost in anger and the silo of ultra-right-wing aggrievement that he stopped viewing other human beings as human. That is true of any extremism. And it is that programming, diametrically opposed to the love ethic, that has always been the heart of violence.